This topic contains 1 reply, has 2 voices, and was last updated by McGrufus 2 years, 7 months ago. Hello. I am a citizen of the USA. Unusual for this forum, I realize. But as the Euro exchange rate swings in favor of the dollar, I am guessing there will be more US buyers entering the market. 1)In the USA a 30 year mortgage is the norm, regardless of age. I am 62 my wife is 59. It seems we can only get a 15 year Spanish mortgage, correct? 2) In the USA, fixed rates are very much the norm. In Spain, it appears fixed rates are very unusual, correct? 3) in the USA there is NEVER a prepayment penalty on a home mortgage. In Spain, from what I can tell there is always a prepayment penalty. Is this correct? 4) In the USA , home mortgage interest is always deductible from your income taxes as an expense, whether the home is sometimes rented out or not. I am uncertain of how mortgage interest is treated in Spain when it is owned by a resident of the USA. We plan to rent the apartment out during high season . I presume we will have to pay Spanish income tax on the rental income. Will the mortgage interest be deductible as an expense? Will any other expenses be deductible, for instance utilities, property management fees, etc. The answers to these questions are VERY important to me. If interest s not deductible as an expense, and there is otherwise no tax benefit to having a Spanish mortgage, it may make more sense for me to just borrow the money I need to complete the sale from a lender in the USA . You are not alone. 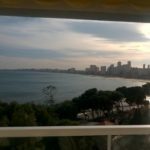 I’m American and last year I purchased a flat in El Campello (Costa Blanca). As you know, the USD/Euro rate has become very attractive and the property values are still depressed from the 2008 crash, so it was an opportunity I didn’t want to pass up. I can’t answer all your questions, but I can tell you that I investigated the mortgage scenarios before I bought and it was an easy decision for me. I chose NOT to apply for a Spanish mortgage. The main reason I made this choice is because I figured the application process was likely to be a nightmare…what with having to document my income and assets in a foreign country and all of it has to be certified, etc. Then you have the problem of making your monthly payments in Euros, which means playing the currency markets for the next 15-20 years. Personally it was not worth all the headaches to me. You, of course, will have to make your own decision. You should also look closer at the rental income situation, if you haven’t already done so. My understanding is that Spain will tax 25% of your GROSS rental income, without regard for any deductions. If that is true, it would probably wipe out any profits you may hope to have. And again, you will have the currency conversion problem when you rent. All this is my good-for-nothing opinion. Take it for what its worth. I bought my place and I love it. All I have to worry about is paying the HOA dues, the utilities, the property taxes (which are VERY low by US standards), and the rubbish collection fee. All this added together amounts to less than $2,000/year. For a wonderful beachfront retreat. I’m very pleased.